I have admired Diana Henry's simple but very tasty recipes in the Waitrose magazine, Waitrose Kitchen, for some time. When I saw the fantastic reviews her recipe books had on Amazon I had to put one on my Christmas list. 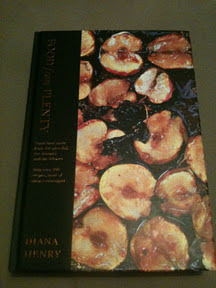 I was lucky enough to find a copy of her book Food from Plenty under the Christmas tree. Here is the first recipe I have tried from it. It is in the section which is a collection of recipes to use up left overs. This one is for left over roast chicken, which I had in the freezer from the last roast I made. I've made a few adaptations, some for choice and some through need, as I haven't been shopping in a while! 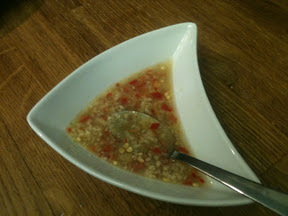 I started by making the nuoc cham which is a Vietnamese sauce which is hot, sour, salty and sweet in equal measure. I then cooked the rice. She uses white rice but I prefer the taste of brown rice, plus it's healthier so I substituted this for brown rice (and slightly smaller quantities). It's cooked using the absorption method. Brown rice needs about 40 mins cooking time. I also didn't have any spring onions so used some lightly stir fried cabbage and also added a few thinly sliced carrots. 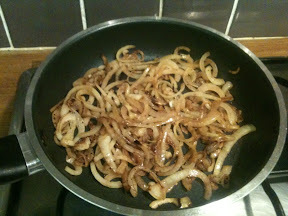 I also didn't have shallots so used onion instead and cooked them for a little longer than she suggested. Finally it was a case of assembling the dish by mixing the chicken, rice and veg and topping with the onions and a sprinkling of nuoc cham and shredded mint leaves. This really was a delicious way to use up leftover chicken and this dish is definitely a sum of more than its parts. The only thing I would do differently next time is to either reduce the amount of garlic or cook it a little first as for me the raw garlic flavour was slightly strong. 2. 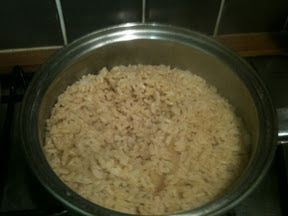 Put the rice, sliced ginger, seasoning and stock in a saucepan and bring to the boil. Put the lid on and reduce the heat and leave to simmer gently for about 40 mins. Do not stir but if the rice starts to stick add a little boiling water. Remove the ginger slices, add a little finely grated ginger and set aside with the lid on. 3. When the rice is almost cooked fry the onions in a little oil until golden and slightly caramelised. Set to one side. 4. Stir fry the carrots for a couple of minutes. Add the cabbage and the chicken and cook until heated through. 5. 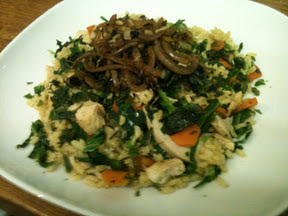 Stir the chicken and veg into the rice and share between 4 plates. Top each one with the onions and mint leaves. Serve with the nuoc cham.